It’s T-14 days to the Half-Marathon, but I don’t have much of a taper in my plan. Next week’s run is the longest, at 10 miles, and today’s was supposed to be 9 miles. I tripped over nothing at all. One moment, I was running along, doing mile splits between 11:50 and 12:40, and the next, I was flying through the air, watching the asphalt move toward me with alarming speed. I landed hard on my hands and rolled to right, banging the heck out of my right leg. My hat flew off. My glasses flew off. 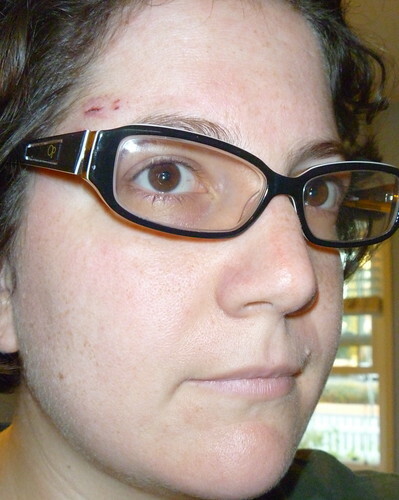 I saw blood dripping on the ground and took a few seconds to realize it was coming from my forehead. I scooped up my things and moved to the grass along the bike path. “Oh, my god, your eye!” exclaimed a guy walking past. He offered to call someone for me, but I waved him off. I walked the 3/4 (or so) of a mile home. It wasn’t until I got home and sat down that I started to feel really lousy. There was blood all over my favorite running shirt. I had scrapes and bruises all over. My glasses were out of alignment. And I hadn’t managed to finish my run. On the other hand, unlike the ill-fated 11-miler in 2002, this run didn’t end with a sprained ankle. Tomorrow, I rest. Later in the week, some treadmill running. Next Sunday, 10 miles. And I’ll be carrying my cell phone. K has suggested that I take up cycling instead. At least I’d be wearing a helmet.